I will admit, beaches have been on my mind. Not only did I get a chance to go to the Long Beach on my birthday but my 'From The Sea' to benefit the World Wildlife Fund (remember that 25% of the purchase price goes to the WWF) went up for sale on July 15 at Jewelry Because. 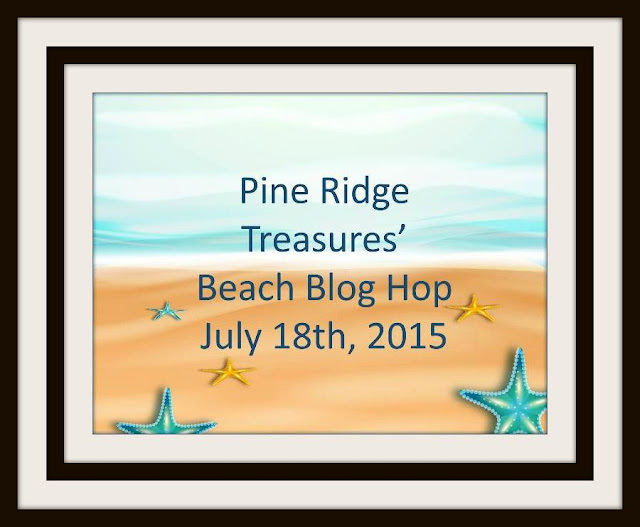 So I have had the oceans on the brain in my thoughts and participating in this blog hop was a no brainer. My first offering is a pair of earrings that I went nuts trying to get a good pic of. I used a white/clear cultured sea glass sand dollar from ZNetShows as first link and it just flat out refused to all me to get a good picture of it. Anyways this is a fun pair of earrings as they make little tinkling sounds as the shell hits the glass. They are going to be donated. Next up is a bracelet that features an artisan, lampwork focal (unfortunately I have this focal forever and I didn't jot down the artist that made it) that just screams the Caribbean waters to me. This focal is hand-knotted along with some more sea glass and glass pearls that were part of the kit I received. Now while I do wear some burnt oranges, this is not a color that I normally work with. When I opened up my kit and saw the orange sea glass, I was stumped. Then I started looking through some focals that I had picked up from Firefly Design Studio when she was doing a destash. I had just tucked them away because I was planning on doing a blog hop where I would send the focals out. As you can guess, I never got around to it. For a change, my procrastination worked in my favor. 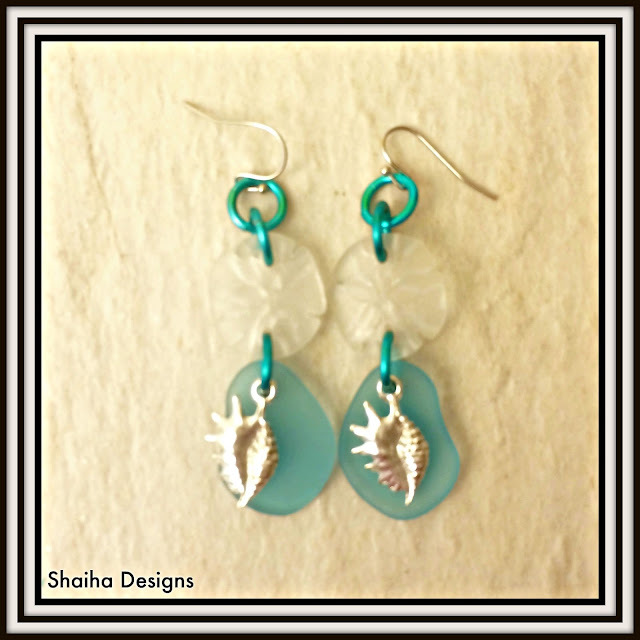 Doesn't that colors of the sea glass set off that focal beautifully? I hand-knotted up the sea glass and the glass pearls on a turquoise waxed linen and finished it all off with a nautical pewter clasp. Beautiful pieces, I especially love that last one! Your pieces are beautiful! 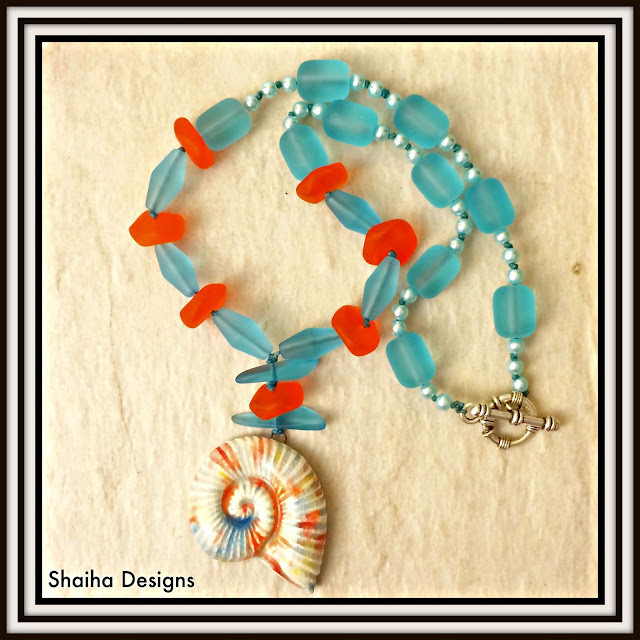 I love the orange and blue necklace, the focal is gorgeous and it all screams beach to me! I love the multiple strands in your bracelet too. Girlie - I LOVE LOVE LOVE your earrings! Holy smack where'd you find those awesome shell beads? Great pieces! =) And TOTALLY jealous of your birthday trip! <3! I love all your designs! 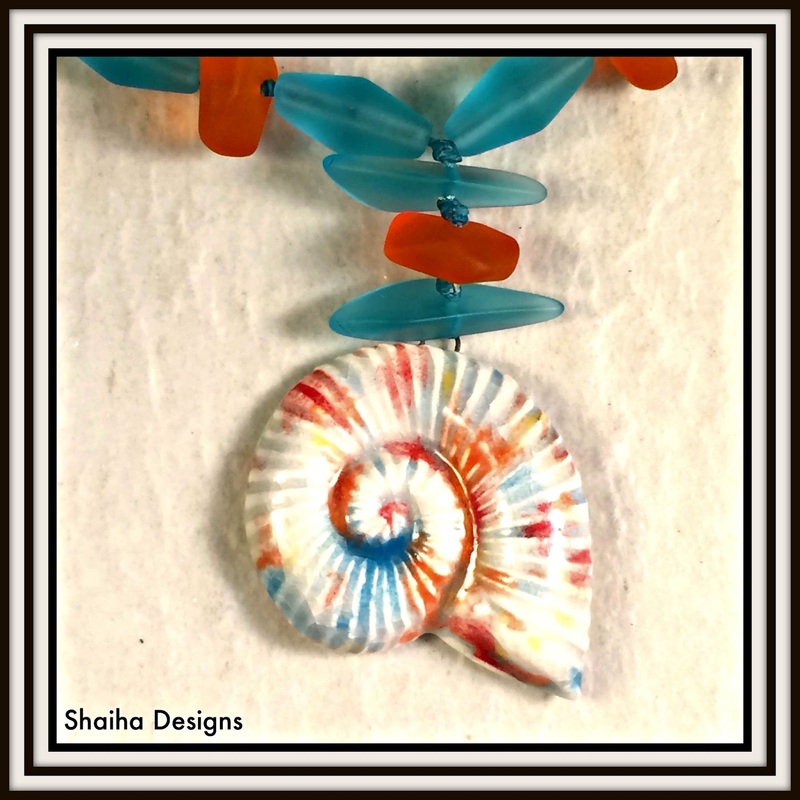 You rocked with the ceramic shell necklace - the colors really pop! Awesome collection, Shaiha! 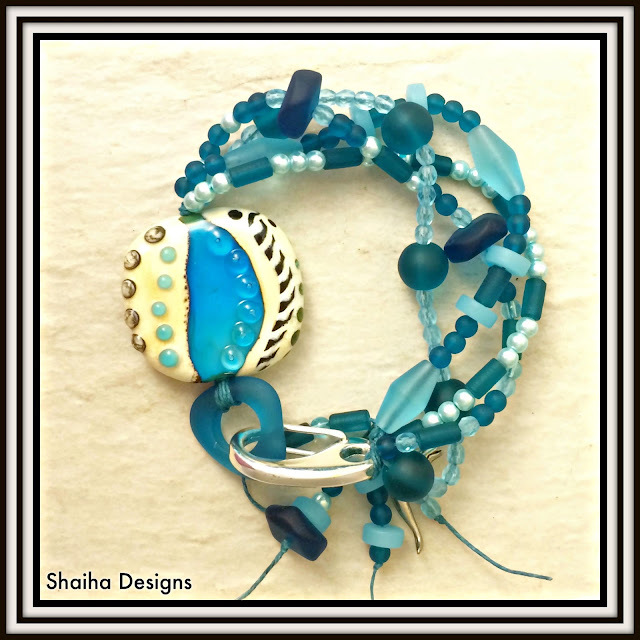 I especially love the multi strand Caribbean waters bracelet with the light yellow and blue focal bead. The orange and blue necklace is nifty as well. Thanks for being in the hop! Oh I love these pieces! Especially the necklace. Orange is my color, and I love it with turquoise. That focal shell is the best - you have the perfect balance in this necklace. I love the focal in the bracelet too. And all the trouble was worth it because you got a great shot of the earrings. I love clear beads, but they are a bear to photo. Hi Shai, I love the first pair of earrings. The first sea glass that Znetshows sent me was orange and I too was stumped as this is my least favorite color. I think that you did a wonderful job of using your orange. Awesome pieces! But I really love the last one. That spot of orange really sets the pendant off! And mixed with the blue just screams beach! Great job! Gorgeous as always! Love, love, love every one of them...and you are so right that focal is perfect with the orange seaglass!